Bancroft, the largest of the “three B’s”, benefits from being home to the Bancroft Meeting Place (www.bancroftmeetingplace.org.uk). This is located on Hadrians Drive and is a perfect venue for all kinds of groups and gatherings. There is a Mums & Tots group that meet on a Monday morning and Bancroft Pre-school (www.bancroftpreschool.co.uk) have sessions on every day. Both these groups are open to all the children in our Parish. 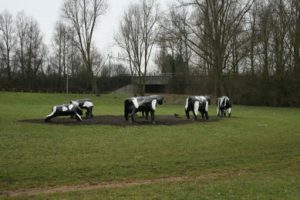 If you follow the redway past the meeting place you will find a nice little play area which is the only part of the park that is the responsibility of MK Council. The Parish Council have been working with residents to obtain additional funding to make some much needed improvements. The rest of the park is in the hands of the Parks Trust who do an excellent job of maintaining this site which includes the remains of a Roman Villa. On a nice day you can come along and bring a picnic and let the children play “Life as a Roman”.